I'm off for a week of visits with family in coastal Lewes, Delaware and scenic Glen Burnie, Maryland (most notable former resident besides me? Frank Zappa). 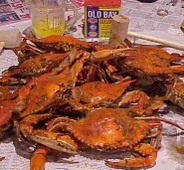 A week of sand, crabs (the kind you eat), beer and snowballs--a Maryland thing. I'll try to keep you posted on any interesting developments.